The runaway success of the Wii games console has seen Nintendo's profits more than double in the last six months. In the six months leading up to September, Nintendo made a super-happy profit of 132.4bn yen (£506m) - a total that's skyrocketed up from 54.4bn yen in the same period one year earlier. In short: Nintendo is flying. 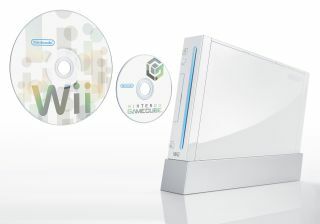 The Wii sold 7.3 million units since March. This has been complemented by continued strong sales of the Nintendo DS handheld, of which 13.4 million were flogged worldwide during the same period. Since the launch of the Wii, Nintendo has gone from being a second-tier gaming firm to a market leader, comprehensively outselling both the Xbox 360 and PlayStation 3. Its strategy of doing gaming differently has more than paid off. The Wii has succeeded with its gesture-based control system, while the DS (with its innovative dual screen approach) has comfortably out-muscled the Sony PSP. Nintendo now expects to have sold 17.5 million Wii consoles by March 2008, a volume of hardware that's worth around £2.5 billion. Despite a reported lack of new games being available for Nintendo's console, Wii titles recently dominated the recent Bafta Video Games Awards in London. Wii games picked up gongs in the gameplay, sports, strategy & simulation and innovation categories, underlining the year of dominance that Nintendo has enjoyed. In comparison, PS3 games picked up no awards at all. And while Nintendo has been raking in the financial rewards of creating a 'fun-but-cheap', distinctly 'standard definition' business model, Sony and Microsoft have been looking on enviously, wondering what they have to do to compete with the Wii's success. We've seen signs of new strategies already. Microsoft, for example, has decided to go after Nintendo's casual gamer market by replacing the Xbox 360 Core SKU with a new 'Arcade' model. It comes with HDMI output, a 256MB memory card (instead of a hard disk), wireless controller and a collection of free Xbox Live Arcade games. Yet despite Microsoft's claims that the Xbox 360 is capable of family fun, it's essentially still the same console as it was before, repackaged and rebranded. With its HD capabilities and media hub aspirations, it's far from being a toy. The Wii's success isn't about producing casual games. It's about an immediate style of gameplay where you can just pick up a Wii controller and physically play tennis. Sony has taken a different strategy to Microsoft. Not only has it introduced a much cheaper 40GB model of its PS3, it's also launching the new PlayStation Eye. A second generation version of the PS2's Eye Toy, it will enable gamers to physically interact with the games they play. But instead of using motion sensitive controllers to do it, it uses a camera which sits on your TV set and senses your movements. These limited changes made by Sony and Microsoft may tempt some. But they're unlikely to make a serious dent in Nintendo's Wii sales - especially with Christmas just around the corner. Despite severe stock shortages, Nintendo Wiis are still comfortably outselling both the other consoles. The Wii is a party console. Try as they might, Sony and Microsoft can't replicate that gaming model. Nintendo's machine is certainly living up to its former codename - 'Revolution'.